Well we had to wait for it, but at least it’s happening – the twice-updated Resident Evil 7 demo is coming to PC on December 19. The new fairly lengthy exploration of the world’s creepiest house will be distributed via Steam, and Capcom are already showing off all the customisation options they’re cooking up over the next couple of weeks of dev time. Meanwhile, Playstation Experience brought the new trailer, embedded above, with another communique from main character Ethan’s poor dead wife. Resi 7 is the first major release of 2017 – but what else has you excited on the upcoming PC games list? As far as we can tell, it’s got everything you’d want to be in there. 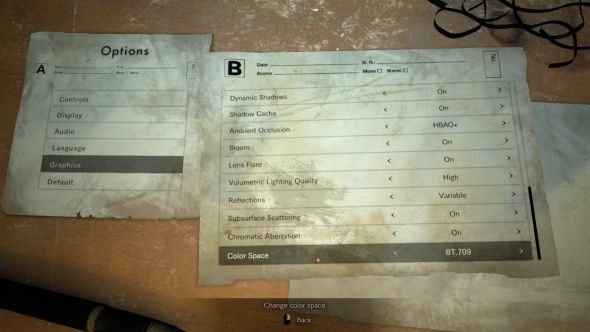 Resolutions are confirmed to go as far as your monitor will support, refresh rates scale up to 144Hz, FOV can be adjusted and frame rates can be capped at 30, 60 or uncapped. It also uses the word “oomph” in describing GPU power, so that’s always a plus. Have a read of the full options here. The demo also received a final update on Playstation this weekend, titled Midnight. It added some more rooms to the house, another weapon in the form of a handgun, and more endings. There’s also a monster to avoid, which ties into the endings, and your new dad returns as well. If you can’t wait to play it, there’s a thousand and one videos of it hanging out on YouTube. All that optimisation work is sadly no guarantee that it will run properly, or that the demo will be representative of how the final game performs on our PCs, but it’s good to see the work being put in. Thankfully, we won’t have to wait several months for a port of the full thing, as it launches January 27 alongside its console friends.